An excellent, if somewhat cold walk over Cross Fell via Wildboar Scar with some superb views of the North Pennines and Lake District. In May it will be five years since my one and only visit to Cross Fell, the highest fell in the Pennines. With that anniversary looming I thought it was high time that I went back again. Back in 2010, along with a couple of friends, I had climbed Cross Fell via the Kirkland – Garrigill bridleway before going on to visit the two Dun Fells. This time I wanted to try a different route to the top so I decided to try the bridleway climbing over Wildboar Scar. Starting from the small village of Blencarn, where I parked on the roadside by the village hall, the bridleway initially crossed a tract of moorland called The Rigg which was covered in flowering gorse. As the moorland narrowed I crossed Blencarn Beck where I startled not one but two snipe from the reeds. As ever with this elusive bird they were too quick for me to capture them on my camera. Continuing on across the narrow Cringle Moor I passed the remote farmhouse at Wythwaite. A gradual climb up the side of Grumply Hill above Littledale Beck then brought me to the steeper slopes of Wildboar Scar. Visibility was superb and looking back beyond Blencarn I could clearly make out a host of Lakeland fells with Blencathra the most prominent. After a steep pull up above Wildboar Scar the bridleway became fainter. At the same time the views of the neighbouring North Pennine tops began to open out. With a white veneer from some overnight snow both Little Dun Fell and Great Dun Fell looked particularly impressive. Climbing gradually along the southern flank of Cross Fell I passed the only person I would see for the next few miles. Not long afterwards I lost the path in the rapidly melting snow. By this time though I was close enough to make a beeline for the rocky rampart that surrounds the summit plateau. Scrambling carefully over the boulders my arrival on the plateau coincided with Cow Green Reservoir and upper Teesdale coming into view. A superbly constructed 8ft high cairn to my right directed me on to the route of the Pennine Way which I then followed up to the summit. The summit of Cross Fell is marked by an Ordnance Survey trig point which is dwarfed by the large cross shaped shelter a few metres away. The views were sublime, to the west I could identify at least fifty Lakeland fells, to the south I could see the Howgills Fells and the hills above Mallerstang. To the north-west I could see Criffel while further back and to the right the faint outline of hills must surely have been the Lowther Hills in Scotland. I would have loved to have spent more time taking in the panorama but it was bitterly cold and windy on the summit. While the wind was very strong it was not the kind to buffet you, it was the type of wind that seems to blow straight through you. Taking advantage of the large shelter I sat down to eat my lunch but even with this protection and the many layers I had on my hands in particular began to get cold. This was quite unusual for me as my hands generally stay quite warm even in the winter. The fact that they went so numb so quickly is probably a good indication of how severe the wind chill factor was. Cutting my lunch short I decided the best thing to do was to get moving again. Even then, with my thick woollen mittens on, it took almost a mile for my hands to warm up and for the tips of my fingers to stop stinging. 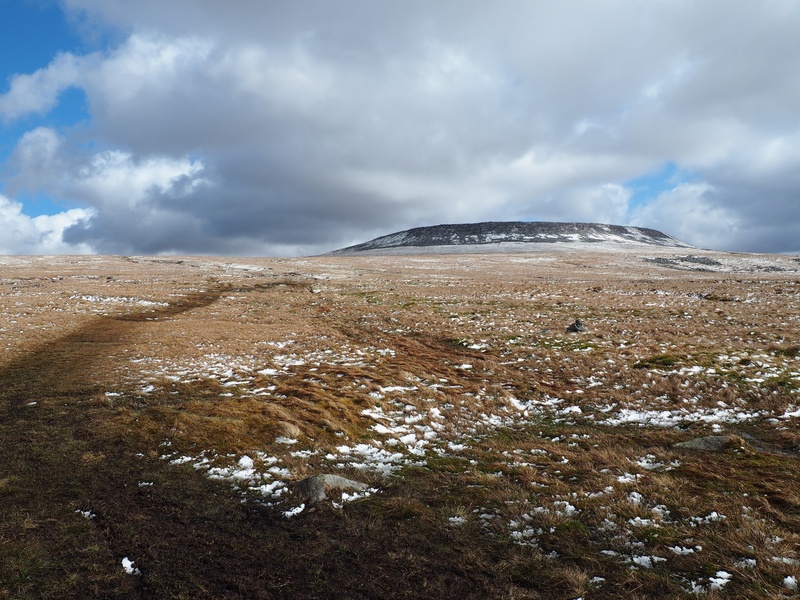 By this time I’d dropped down to the bridleway that climbs over the north flank of Cross Fell between Garrigill and Kirkland. Descending gradually towards the latter I had a panorama of Lake District fells directly ahead of me. The highlight of the descent though was the arrival above the small valley of Ardale and some dramatic views to the head of the valley which is called Black Door. The final stage of the walk was on a nice track that led around the front of High Cap and Wildboar Nook to reach the tiny village of Kirkland. From there I took a footpath across a large field to then walk around the edge of Blencarn Lake and back to the start. This was another super walk in the North Pennines coming so soon after the fabulous day I enjoyed on Backstone Edge. Visibility could not have been better and the overall conditions for trying out my new Olympus EM-10 camera were, strong winds apart, almost perfect. Considering Cross Fell is the highest hill in the Pennines I feel I have neglected it somewhat so it felt good to go back especially as it was quite hazy on my first visit. This walk was first published on my MyPennines website.